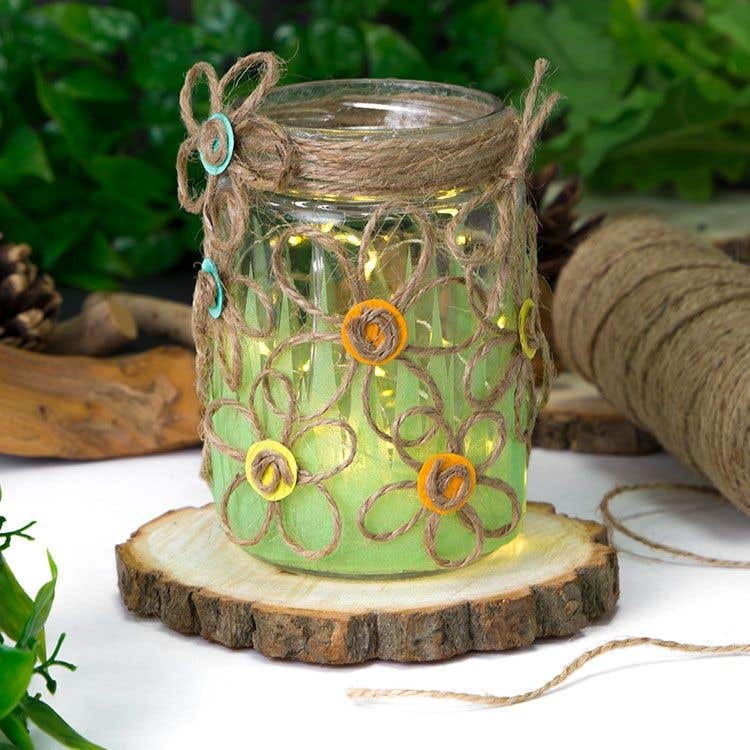 Transform a plain glass jar into a lantern with simple flowers made from twine. This would make an ideal addition to picnic or rustic table setting. Cut 10 x 1.5cm diameter circles from coloured card. Cut 10 x 40cm lengths of twine. Stick a small piece of double-sided tape to cover one of the card circles, lift off the backing then press the end of a piece of twine onto the sticky tape. 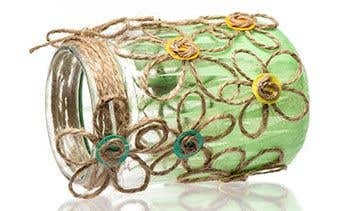 Loop the twine into a petal, then press down on the sticky tape again to hold the shape. Continue looping petals until there are 5 or 6 in total. Make the petals 2cm in length for a smaller flower, or 3cm for a larger flower. Trim off any left over twine. Turn the flower over. Add a blob of glue in the middle of the card circle and leave until it becomes tacky, then coil a short piece of twine (2-3cm) and stick it onto the card. Use a cocktail stick to help shape the twin into a circle or spiral. Leave to dry. Make more flowers in the same way. Cut 3 or 4 green tissue squares into 8cm wide strips with a zig-zag edge to look like grass. Lightly brush some glue around the bottom half of the jar and carefully stick the tissue over the top. 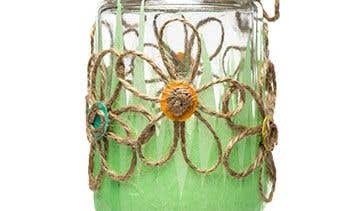 Stick a piece of double-sided tape around the rim of the jar, peel off the backing tape, then then wind a metre length of twine around the top of the jar and tie the ends together in a bow. 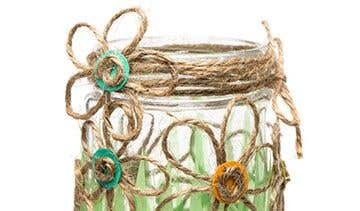 Stick the finished flowers onto the jar with double-sided tape or glue. For making the petals, add an extra piece of double-sided sticky tape if you need to after making 3 or 4, so the flower sticks together. Once the flower is formed you could also add a blob of glue.